This project seeks to understand how decisions are made around child care and protection when parental mental illness or addictions are one of the factors under consideration. 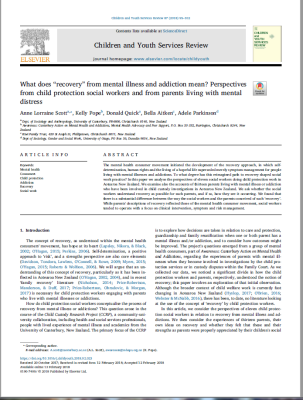 The project regards (or takes the viewpoint of the parent) in regarding the illness/addiction as serious if it becomes a factor in decision-making around child care and protection. The project also seeks to understand how outcomes can be improved for such families. The project is designed in three phases. In the first two phases, we will interview a wide variety of stakeholders to the child care and protection process, including social workers, family court lawyers and judges, midwives, mental health workers, and also parents and family/whānau members who have been through the care and protection process. In the third phase, we plan to design and evaluate an educational resource for professionals, parents or families to help address the situation we find. This project is being undertaken by a community-based working group under the leadership of principal investigator, Dr. Anne Scott of the University of Canterbury. Dr. Anne Scott is a sociologist of health and medicine at the University ofCanterbury, with a focus on mental health and wellbeing. She has prior publications in the areas of peer support in mental health; the mental health consumer’smovement; genetic testing; biobanking; approaches to hepatitis C treatment; and community informatics. She has recently co-published a text: ‘Social, Political and Cultural Dimensions of Health, Springer, 2016. Ms. Kelly Pope: coordinator of Awareness: Canterbury Action on Mental Health and Addictions, (which is centrally involved in this project) and family support worker at the Caroline Reid Family Support service, Stepping Stone Trust. Formerly a youth consumer advisor at the Werry Centre. Dr. Don Quick: recently retired psychiatrist, currently studying the anthropology of belonging and connection at University of Canterbury. Ms. Sarah Wylie: Independent social researcher and member of the research committee of The Collaborative for Research and Training in Youth Health and Development. Ms Bella Aitken: Manager, youth and family mentor and qualified child protection specialist at Kiwi Family Trust. Dr. Cathy Solomon: semi-retired teacher & researcher with an interest in education, society and social justice who is associated with the University of Canterbury. Ms. Jane Ross: social researcher with a background in editing and narrative and a MA in public policy. Research and Training in Youth Health and Development.